(3) letter writing samples for you to take action to promote safe cigarettes by contacting government officials with authority to accomplish that goal. TCPG presents this issue from multiple approaches, to enlist as broad a based community support for safe cigarettes as possible. Rather than the limited "health only" aspect others focus on, TCPG recognizes that people have wider interests, hence, identifies multiple examples of the ill effects of unsafe cigarettes, and places the subject in more comprehensive context than other sites. The issue of safe cigarettes is both a smokers' and nonsmokers' rights issue. Others give the impression that the rights clash, but TCPG looks to the common ground: Everybody is entitled to safe products. Tobacco companies are the only ones regularly violating this consumer protection principle, by their discriminating against smokers, the only people denied normal consumer product protection against products laden with toxic chemicals that kill when used as the manufacturers intend. Nonsmokers would not object to safe cigarettes that do not emit hazardous emissions. For admission to any of the medicolegal areas, please click on the highlighted words of interest to you. Be advised that some of this information from medical journals, law books, and court precedents (as it is so very contrary to lay-mythology of the type typically in the media) may be upsetting. (There was, in past eras, hostile reaction to information that, e.g., the earth is not the center of the universe, and is so round that one can go west and arrive east!! Myth-busters are not always well-received!) So while the medical and legal information here is suitable for all ages, discretion is advised. Michigan's safe cigarettes' law is an example for the nation and the world. It protects both smokers' and nonsmokers' rights by banning deleterious and adulterated cigarettes while allowing safe cigarettes. It avoids criminalizing children, as others do. Others' proposals, such as H.R. 1130, only require fire-safe cigarettes. Michigan leadership since 1909 requires cigarettes to be ingredients-safe, comprehensively safe, the same consumer product requirement as for all other products. For more information, see TCPG's analysis of the law. See also our activism site. Doctors have long known how to ascertain substances' effects on the body. This skill has been mastered, refined, and enhanced over the centuries, since at least the 1500's. So tobacco hazards have been recognized for four centuries. The fact that tobacco-hazards-knowledge is so ancient, is unknown to moderns is due, primarily, to media censorship and tobacco lobby fraud. Michigan's John Engler is one governor who, by Executive Order banned smoking in state buildings, tobacco sales on state property, and production of cigarettes by state prisons due to cigarettes' adverse impact. In an e-mail message to this web writer, he identifies some of cigarettes' adverse effects on the state. He has gone so far as to declare a cigarette smuggling emergency. In a 22 Jan 1999 letter, he advised TCPG that as requested, he asked the Michigan State Police Director to look into enforcing the law. As the law remains unenforced, more letter writing is needed. The Director of Michigan's Department of Community Health, James K. Haveman, Jr., has verified the Michigan safe cigarettes law twice, in a July 1997 letter and in a follow-up September 1997 letter. The law was one of the four model laws cited by the website author, in the American Journal of Public Health, May 1997. Cigarette companies, for legal reasons, dare not admit that their product is deleterious, hence, they do not on-the-record oppose the Michigan type of clergy-influenced careful wording. This wording cannot be denounced as prohibitionist, as it officially allows safe cigarettes, if any. In this way, the law is like any product safety law, safe items are allowed, dangerous ones are not. Other less dangerous drugs are banned by the federal Controlled Substances Act, 21 USC 801 et seq. Tobacco should definitely be deemed covered by that law in view of its meeting the 21 USC 811c et seq. criteria. For details, see our website showing partial action as unconstitutional, and our website urging coverage of tobacco by the Controlled Substances Act. (b) Michigan Attorney General Jennifer M. Granholm urging her to take "cease and desist" action to enforce the Michigan law, using this sample letter. If you prefer shorter versions, here are some short sample letters to them. The author of this website has published papers on the subject of smoke-free work places pursuant to federal law 29 USC § 651 - § 678 and 29 CFR § 1910.1000, in the New York State Journal of Medicine, Indoor Air Review, and American Journal of Public Health. He has also shown cigarettes' high cost to society and taxpayers. Such data, dating back a century, helped lead to the Attorney-General and Department of Justice, cost recovery litigation. Both smokers' and nonsmokers' rights advocates use words such as "choice," "consent," sellers' "intent," etc., words that have precise legal meanings. For quotes and data from law dictionary definitions and court case precedent analyses of such terms, click here. Of course, for legal advice, consult an attorney. But do not hesitate to familiarize yourself with a law dictionary at a public library or perhaps at your local court house law library. Or read the many court cases. All information here is placed here pursuant to the necessity doctrine. The Michigan State Legislature had a report on cigarette hazards in 1889. Both Iowa and Tennessee banned cigarettes in 1897, the same year a boy named Adolf was being expelled from school for smoking. The cigarette-cancer link was well-established by 1925. So officials cannot plead ignorance!! Medical analyses of the death rate caused by tobacco range into the tens of millions. Are the mass numbers of tobacco deaths a holocaust as the Royal Society of Physicians alleged in 1971? For a case law analysis, click here. For an international law context for the tobacco genocide issue, click here. That material is an introduction. Efforts at obtaining an international law solution to problems with worldwide impact have long been attempted. In addition, for data on extraditing those responsible for tobacco deaths pursuant to established criminal prosecution concepts, including the United States v Noriega precedent, click here. Tobacco issues go back to the slavery era. Slaves were used in tobacco raising. Slaves experienced tobacco-related family destruction. Tobacco still causes family destruction via mass disease, suffering, and death. As the various state, common, statutory, and international laws cited herein show, doing these things to people is illegal. This site offers a perspective on tobacco raising as having a long history of illegality, due to the fact that slavery was illegal and unconstitutional pursuant to case precedents and constitutional law analyses. Details and related materials were cited by abolitionists of the anti-slavery era such as William Goodell, Benjamin Shaw, Lysander Spooner, Joel Tiffany, Abraham Lincoln, Frederick Douglass, and Henry Wilson. Analyses of slavers' immorality were provided by abolitionists such as Harriet Beecher Stowe and William Lloyd Garrison, by Catholic activists, by Parker Pillsbury, Theodore Weld, and many others. Employers have a duty to provide safe coworkers, i.e., no smoking on the job. As long as cigarettes remain unsafe and create hazardous levels of toxic emissions, the common law duty against negligent hiring, the duty of employers to not hire persons dangerous to themselves, others, and property, will remain an issue. This fact makes enforcement of the safe-cigarettes law urgent, and passage of such a law where none exists. And see, for example, the precedent of getting a court injunction requiring safe coworkers banning smoking. This concept (seeking injunctions) is also being used in condominiums and apartments. Workers' rights to safe job sites were sought in a court case by a worker, Victor Eskenazi, in the State of Washington. He was following the Donna Shimp and Leonard Perkins worker safety injunction precedents. He sought assistance in the effort at his website, but his effort to set a precedent to protect all workers was vehemently opposed by the Washington Attorney General. Fortunately, another case in the state did succeed at the Washington Supreme Court. See also examples of smokers' worker compensation cases. Tobacco was a Confederate product. After the Civil War, Confederate soldiers returned to their old occupations, including tobacco manufacturing. Their anger at the North for having won the War, led them to change the tobacco formula, to add adulterants including toxic substances including coumarin (for rat poison), and to raise the plant (trilisa odoratissima) producing coumarin in such vast quantities as to be able to produce millions of pounds of it. 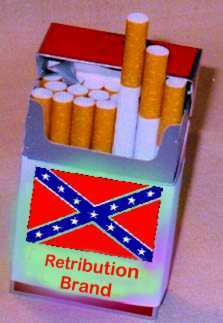 Think of cigarettes as having a confederate label. This helps explain what may otherwise seem inexplicable: a "business" knowingly, intentionally, making unsafe products mass killing people, a business whose product placement practices enable a high rate of shoplifting. No, it's not a "business," it's enemy terrorism, and linked to terrorism via the drug-money trail. When an army places mines for enemies to be injured thereby, any and all methods of bringing them into proximity of the killing devices are standard practice. These practices include deception. Are you surprised at a revenge motive among tobaccoists? Remember this fact: Others elsewhere have attitudes of revenge for past wrongs, real or imagined, even dating back centuries. (For example, think of the late 1990's war in Serbia around Kosovo, arising from events dating back six centuries, to around the year 1389). Was Confederates' anger against Yankees any different? The mass death rate evidence tells us, no. The last code between Robert E. Lee and Jefferson Davis (who had used chemical warfare against the U.S.) in 1865 was "come retribution." Yes, their last code was "come retribution." Rat poisoned cigarettes are retribution, indeed, murder. Pictures with their smiling faces, standard military deception, are intended to deceive. They retained the widespread hatred of America, damn Yankees, blacks. Yes, hatred. For those with an historical inclination, Michigan was (as a result of knowing the foregoing) a leader in the nineteenth century tobacco control movement. Also available is additional legal analysis and a test of readers' knowledge on tobacco issues and a site on protecting young people from tobacco. As tobacco has a long record of being dangerous and/or adulterated, there have been many lawsuits on various aspects of the danger, for example, in Pennsylvania, West Virginia, and Iowa. TCPG's writer of this site was the first to identify the high cost to society of cigarettes. Also available is his paper supporting the Attorney General lawsuit seeking recovery of the taxpayers' money spent on tobacco-caused health care. While the Attorney General cigarette costs reimbursement lawsuit under former Attorney General Frank J. Kelley (1961-1998) was in process, there was a petition to the judge to enforce the Michigan safe cigarettes law by issuing a "cease and desist" the violations order. The deal was so bad that it does nothing to meaingfully reduce cigarettes, and is being challenged even by distributors. A bibliography of others' writings helps explain why the cigarette control law is unenforced. The media are involved too. For an example of a media writer being held responsible for her words, click here. So-called think tanks also periodically write pro-tobacco progaganda, for example, the Cato Institute, see exposé. Michigan has suffered from so much cigarette smuggling via cigarettes from other states, that our Governor declared an emergency over it, see text of finding. Cigarette smuggling has occurred elsewhere as well. Cigarette companies have in essence aided and abetted cigarette smuggling, even across country lines. For example, see the paper on cigarette smuggling in Italy, and one on German Cigarette smuggling, entitled "The Nicotine Racket: Trafficking in Untaxed Cigarettes. A Case Study of Organized Crime in Germany," a guest lecture given at the Institute for Criminology of the Oslo University, Norway, in May 1999 by Klaus von Lampe. (Hitler smoked). Much of the information herein has been filed in courts, for example, in the Alabama Fletcher case. Also, many of us have heard of Dr. Jack Kevorkian and the assisted suicide issue. The author of this website brought an otherwise overlooked context to this issue, the cigarette role in suicide, via a medical data and law analysis in a petition and brief in a 1997 Kevorkian case, and in the recent (August 1999) Georges Reding case. Somewhat more elaboration on some of these sites is at TCPG's No-Smoke Home Page. See also a review of the 2007 Movie "Sicko." We also have an overview of the Kentucky youth activist group. a law banning cigarette manufacturing. YES! Encourage seeking that type law everywhere. The author is available to speak to your group - of whatever interest as may be evident from the range of above topics - to encourage letter writing to get the cigarette control law enforced, thus prevent the many types of cigarette effects. (A letter writing meeting involves members bringing envelopes, paper, and stamps, ready to write to the various officials with the ability to get the Michigan law enforced: the Governor, Attorney General, State Police Director, Prosecutors, Sheriffs and Police Chiefs.) To send an e-mail request to the author, click here.